Books del Hoyo, J., A. Elliott, and J. Sargatal, eds. Handbook of the Birds of the World. Vol. 7, Jacamars to Woodpeckers. Barcelona: Lynx Edicions, 2002. Sclater, P. L. A Monograph of the Jacamars and Puffbirds, London: R. H. Porter, 1882. 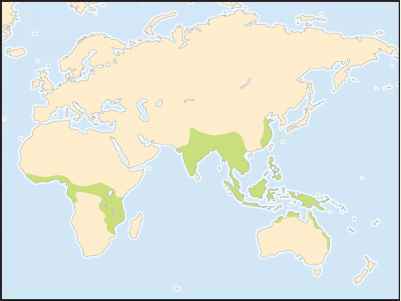 Mostly tropical forest and forest edge, with some species (including most African ones) thriving in secondary forest, parkland, and even suburbs with many ornamental trees; a few live in drier, thornbush habitats with large termite mounds. Endangered: 1 species; Near Threatened: 9 species.